Seven Stories Press, 9781609808600, 256pp. Barry Gifford has been writing his Roy stories on and off for over thirty years, and earlier Roy stories have been published in Wyoming, Memories from a Sinking Ship, and The Roy Stories. But it is in The Cuban Club that he brings the form he has created in these stories to its crystallization. 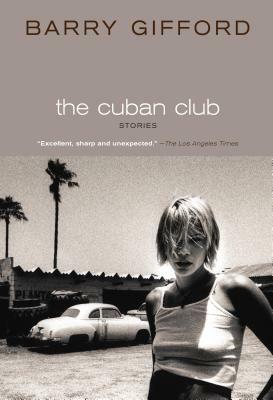 Indeed, to find precedents for The Cuban Club, we must look not to other story collections, but to other creation myths—to Gilgamesh, or the Old Testament, or Eduardo Galeano's Memory of Fire trilogy. Roy's age here wends back and forth between six and nineteen and back to twelve. He sees with the eyes of a seer who doesn't seem to age, and knows not to judge the good or the bad in circumstances or people, or even to question why things are as they are, instead filled with the romance of the world teetering on catastrophe always, but abounding in saving graces. BARRY GIFFORD is the author of more than forty published works of fiction, nonfiction, and poetry, which have been translated into thirty languages. His most recent books include The Up-Down, Writers, Sailor & Lula: The Complete Novels, Sad Stories of the Death of Kings, Imagining Paradise: New and Selected Poems, The Roy Stories, and Landscape with Traveler. Gifford lives in the San Francisco Bay Area. More at www.barrygifford.net.